These are mostly easy to moderate hikes of shorter distance and duration. Some can be extended into backpacking trips for more information see the backpacking trails page. Interpretive trails are usually short trails that are marked with specific features or views along the length. Explained by either a interpretive sign or numbered brochure/handout, natural features, geology or other highlights may be marked. Length : 4 miles round-trip. Length : 1 mile to end of canyon, .5 mile to natural bridge. Length : .5 mile round-trip. 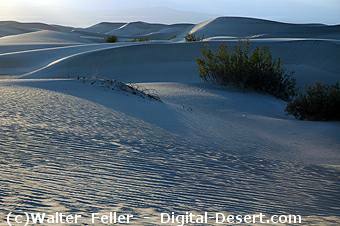 Length : 2 miles to highest dune. Length : .5 to 2 miles, one-way. Length : 1.5 miles, one-way. Length : .5 mile, one-way. Length : 1.2 mile to top of first butte. Length : 3 miles, one-way. Length : .5 mile to first summit, 4 miles one-way to Mt. Perry. Length : 4.2 miles one-way. Length : 7 miles, one-way. 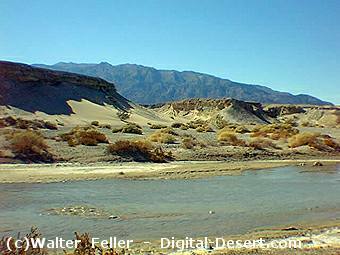 Before starting a hike, obtain current conditions, water availability, and weather forecasts. Overnight backpackers should obtain a free permit. Always carry water. Two liters per person for a short winter dayhike; four liters or more in the summer or for long hikes. 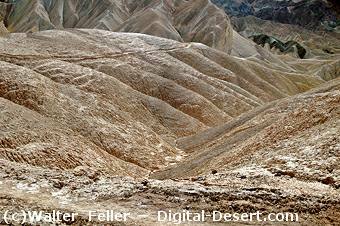 Constructed trails are rare in Death Valley national park. Trails are provided in places that are heavily used and sensitive to damage. If a trail is there, please use it. Most hiking routes in the park are cross-country, up canyons, or along ridges. Footing can be rough and rocky. Hiking the low elevations can be dangerous when it is hot. 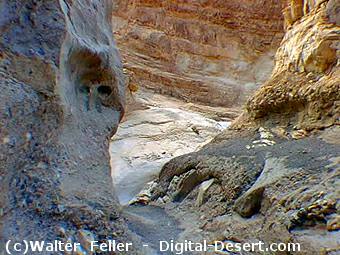 The best time to hike in Death Valley is October through April. The high peaks can be covered with snow in winter and spring. Dogs and bicyles are not allowed on trails or in the wilderness.